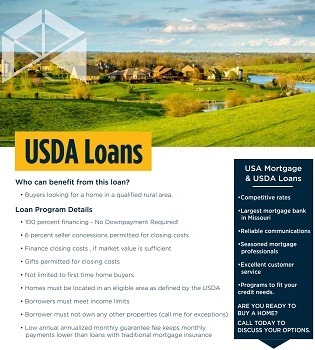 USDA loans are 100% financing options for purchasing a primary residence in qualifying areas. This type of financing is backed by the Rural Development Wing of the United States Department of Agriculture. USDA loans are only available in specific locations and have are income limitations based on the household size that the applicants must be below. USDA Rural Development has partnered with local lenders to help them extend 100% financing opportunities to rural individuals and families. The property itself must meet USDA location and condition requirements. There are many positive aspects to applying for USDA loans if you are not eligible for a Conventional Loan, but there are income limitations and restrictions that vary by different counties and the number of family members that will live in the household. USDA Home loans can be used for the purchase of a primary residence. USDA charges an annual service fee of .35% of the total loan amount, which is paid monthly. USDA also charges an upfront funding fee of 1% of the loan amount. This is a one-time fee and can be rolled into the loan. Borrowers with lower or no credit scores who can’t qualify for conventional loans. Borrowers who are looking to purchase homes in smaller towns and out of city limits. Clients with little or no money for down payment. First-time homebuyers are looking for more affordable monthly payments. If the property you are purchasing appraises well above the negotiated sales price, a USDA home loan is the only program that allows the option of financing other applicable closing costs and pre-paid, above the loan amount and guarantee fee. Number 1 USDA lender in Missouri five years in a row. Accepts lower credit scores compare many other lenders. Offers lower or no lender fees for USDA loans. USA Mortgage’s Columbia, Missouri branch has the resources needed to make your dream a reality. If you are ready to move forward with your next home purchase, contact us to get started.